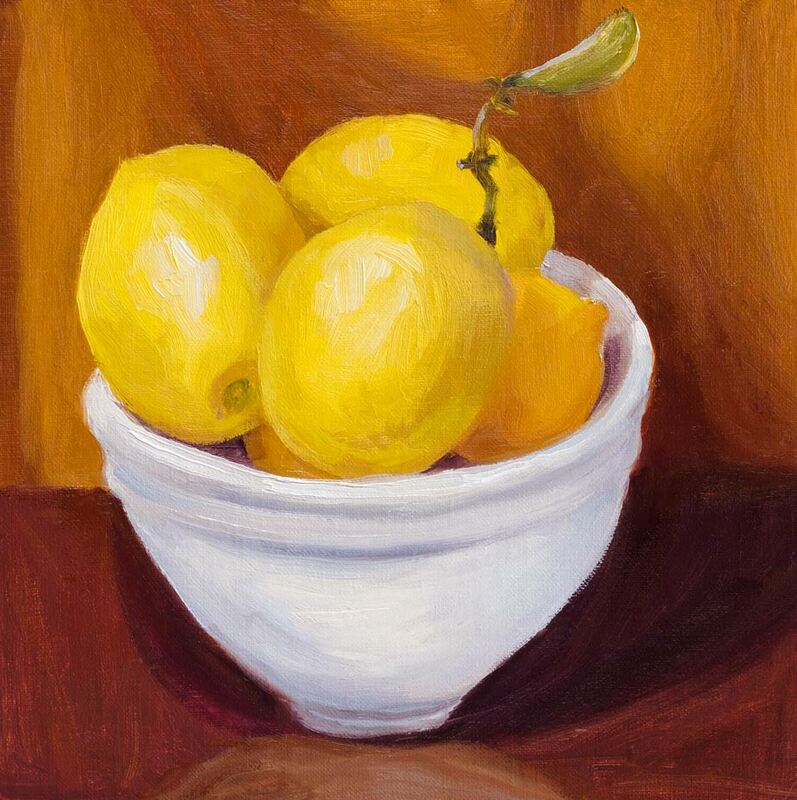 Meyer Lemons Bowled, oil on linen panel, 8x8"
These lemons came from my little Meyer Lemon tree which produces the sweetest, plumpest lemons. I planted the tree from a small pot about 5 years ago and now it’s as tall as me. I really like the Centurion Oil Primed Linen Panel I painted this on, except that it takes much longer for the paint to dry than when painting on Gessobord because it doesn’t sink in to the oil priming. 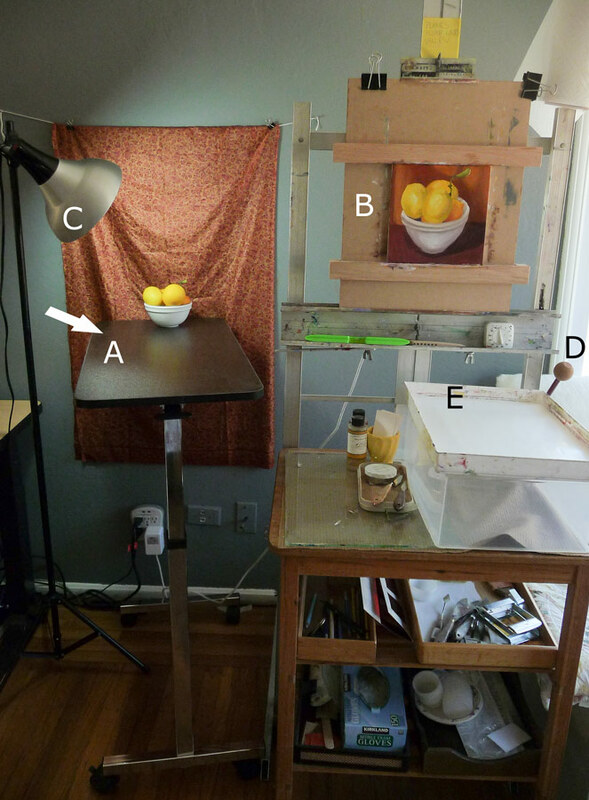 I set up the bowl of lemons on my new rolling, adjustable (from 28″ to 45″ high) still life stand, also known as an Over the Bed Table on Amazon where I got it with free shipping (good thing because it’s not light). Since I was taking a picture of it I thought I’d also describe the other items in the photo since I’m so happy with my painting set up. 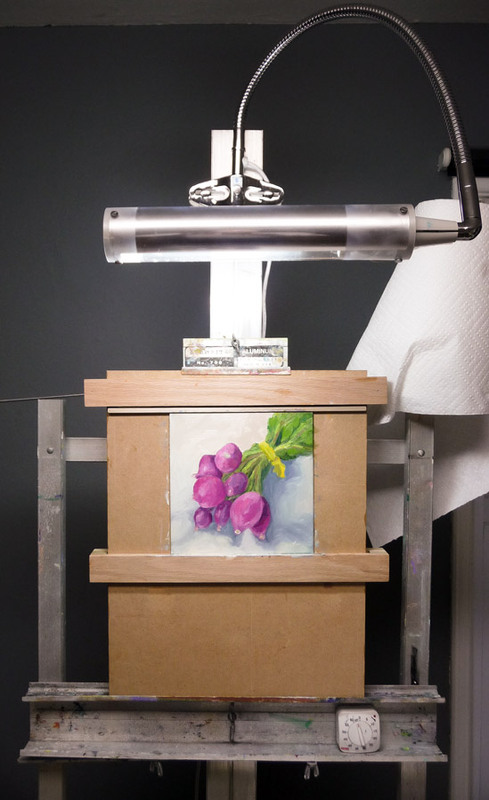 B = Karen Jurick’s “Alter Easel” which I love for holding thin panels instead of trying to balance them between the narrow supports on my easel. Works great! 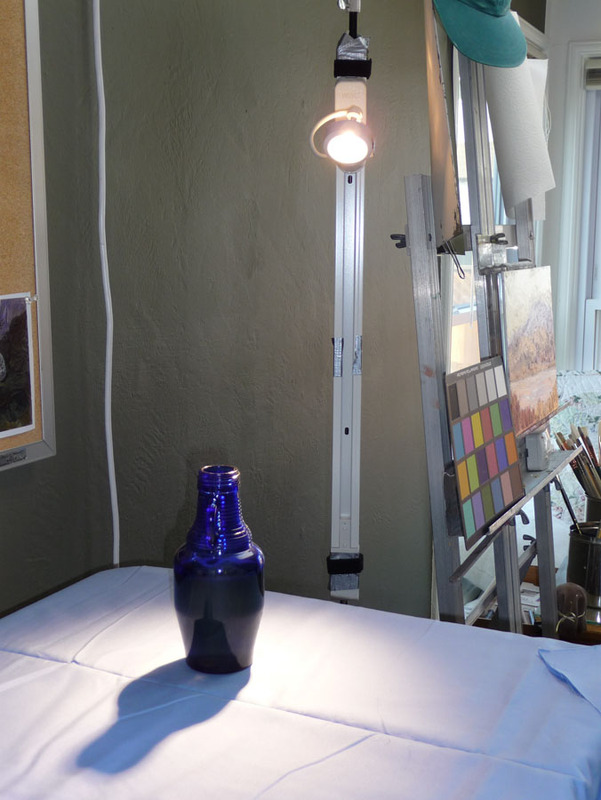 C = Daylight Studio Lamp for lighting the still life (not visible is the Daylight Artists Easel Lamp that is attached to the top of my easel to light the painting (that I was given for free by the company and liked so much I bought the standing light). D = A silly maul stick (just the top shows) that doesn’t work very well. I’ve seen people using canes instead, hooked over the top of the painting to provide support for your hand when painting details. E = Masterson Artist Palette Seal with a lid that seals like Tupperware and with a pad of palette paper inside (the palette paper is a recent discovery that I LOVE because it saves so much time from having to clean the palette.) I keep the palette in my freezer when I have paint left over. Once thawed (in a few minutes) it’s in perfect condition for the next painting session. 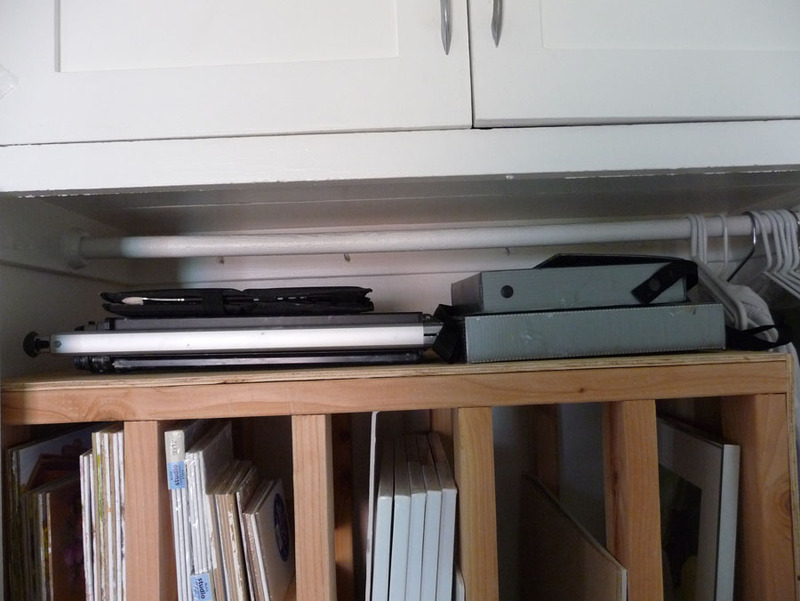 The palette is on top of an upside down plastic drawer from a defunct rolling cart to raise it up high enough for me to use without bending over (I’m 5’10”). Not lettered but in the picture is the beautiful silk sari fabric my friend Barbara gave me for my birthday for just this purpose and the ancient microwave cart that holds my palette and supplies. Not shown is the rolling plastic taboret I’ve had for 20 years that holds my brushes and other stuff. When painting outdoors, lighting is controlled by the sun, clouds, atmosphere, and time of day. But in the studio you get to choose your lighting source from window light to bulbs of all kinds. 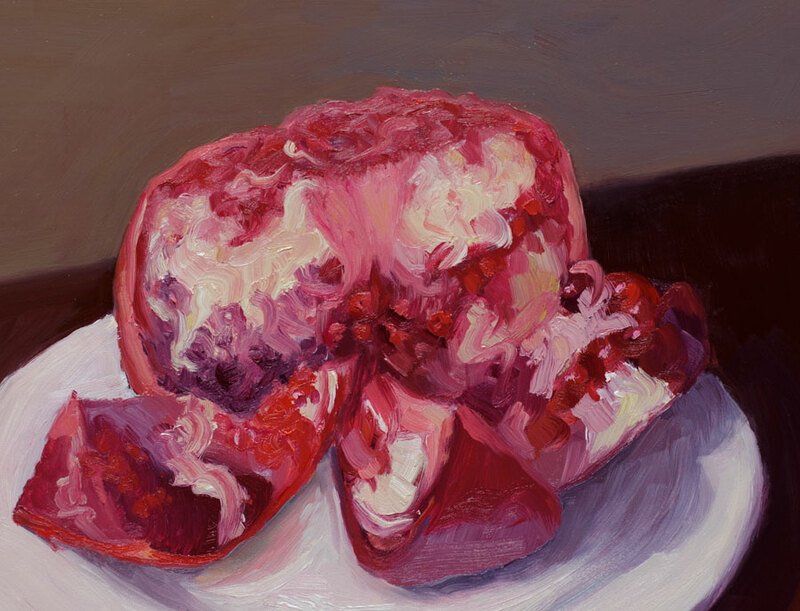 In an article about color in the March 2011 Artists Magazine, Scott Burdick suggests an experiment to compare the effect of cool and warm light sources: Set up a still life of primary-colored objects and paint it twice; once under a warm light and again under cool light. That’s what I did in the studies above. While I’m not sure I captured every nuance (or get the drawing just right), it’s interesting to see how different the same-colored objects and white background cloth look under different “temperatures” of light. 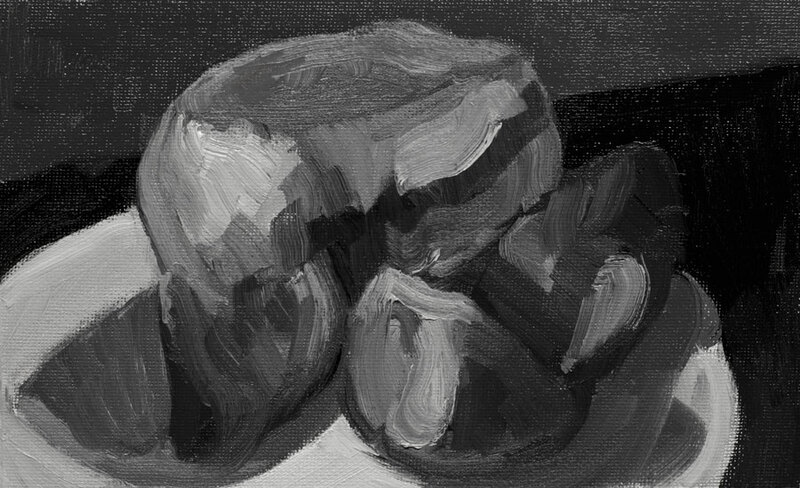 I did these two studies in Peggi Kroll-Roberts‘ studio, with the subjects lit by 150 watt incandescent bulbs which have an even warmer color temperature than the bulbs I used in my two top studies. 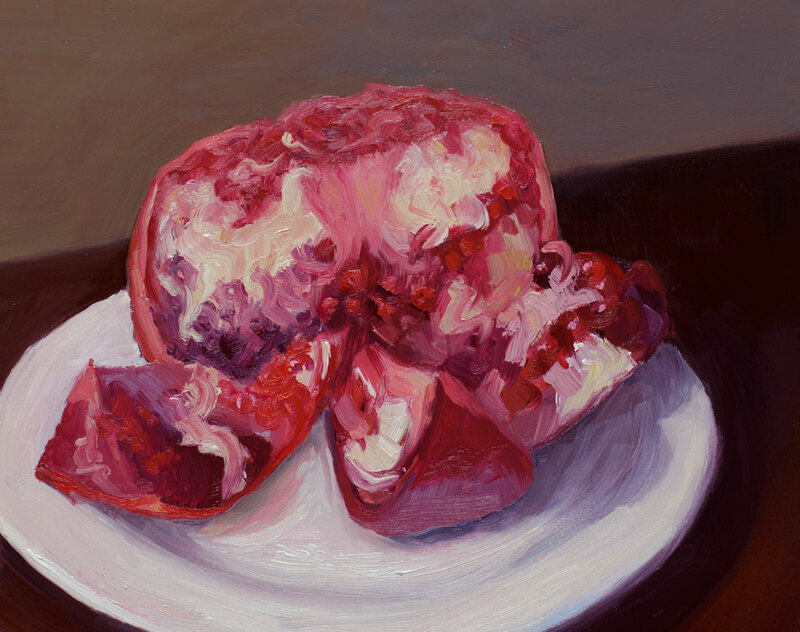 The actual goal of the study on the left was to paint the scene (cantaloupe and watermelon slices) with as few brush strokes as possible. The assignment for the one on the right was to group and paint the shadows with one color only. I’ve made some improvements to lighting and comfort in my studio and wanted to share what I’ve learned in the process. 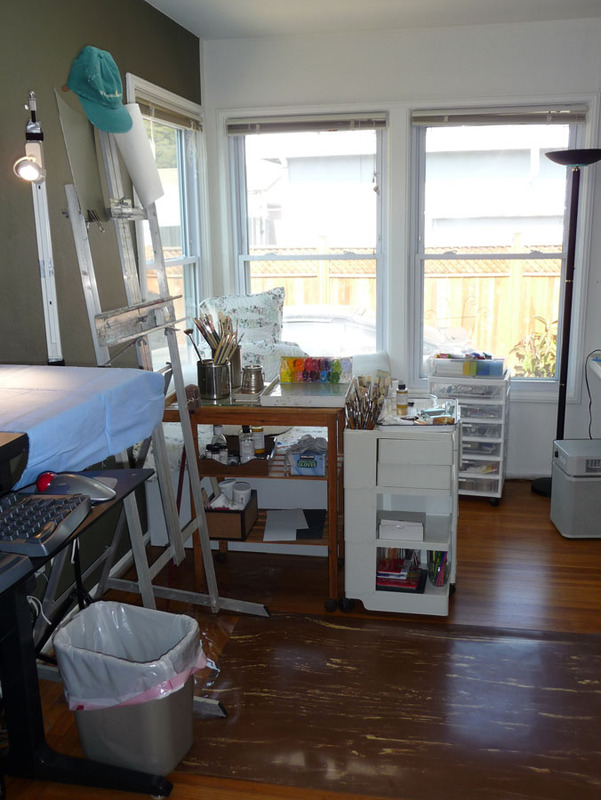 In the picture below you can see some of the changes from my previous post about reorganizing the studio. These include the floor mat, the wall paint, and a still-life lighting setup. The floor mat pictured above makes a huge difference in comfort. I got the idea at my hairdressers when I wondered how she stands all day. She pointed out her floor mat and when I felt how cushy it was, I had to get one. I work standing at a computer or at the easel much of the time. Without a cushion my feet tend to hurt by the end of the day. I tend to sit until my back hurts and then stand until my feet hurt and then switch agin. The mat makes it comfortable to stand comfortably for much longer. 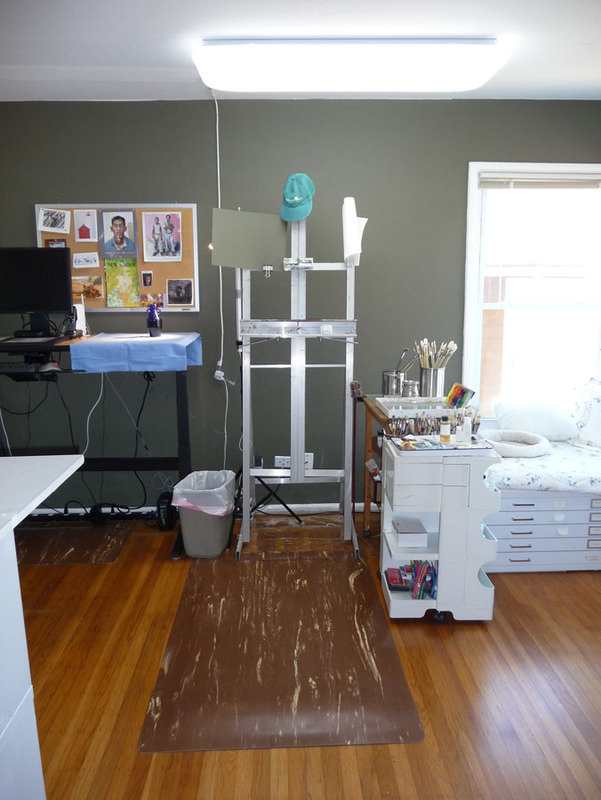 I painted the wall behind my easel and desk Benjamin Moore “1490 Country Life” using their new Aura line of which is nearly odor free and covers in one coat. I’d noticed studio walls painted this color in many of the painting videos I’ve watched. Finally one of the artists actually specified that this 1490 color was especially popular with portrait artists for their studios because of how the color sets off skin. 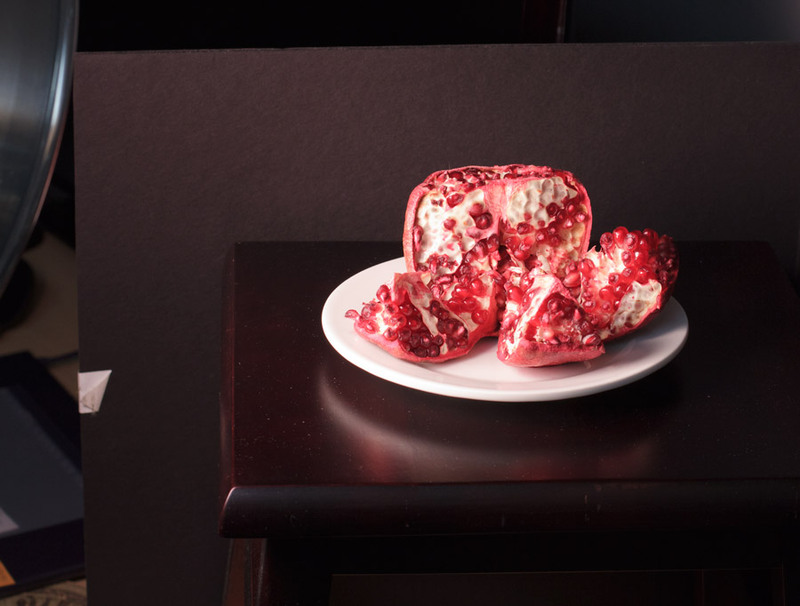 But it also reduces the glare off of the previously white wall I was getting from my overhead light and helps to cut unwanted bounced light and the resulting double shadows on a still life that I’m lighting with a strong directional light (more about that in a minute). I still have to wear the hat you see hanging on the ease—the overhead fixture does a beautiful job of lighting a canvas without reflection, but with a relatively low ceiling it’s pretty bright on the eyes. 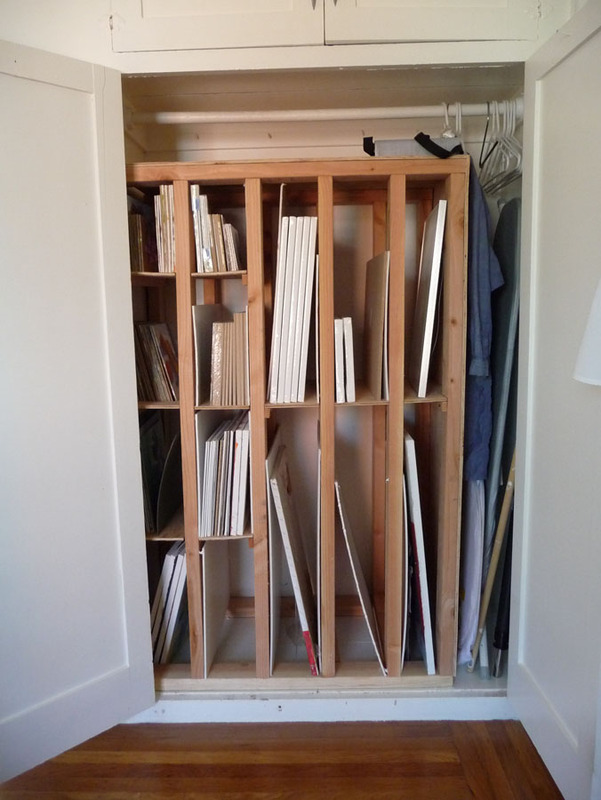 Below is the wonderful canvas and supply rack that my next door neighbor built for me. It can be free standing but was built to fit inside this closet. The four sections on the far left hold already painted panels and for now, the rest hold panels and canvases ready to paint. The structure is seriously overbuilt due to a slight miscommunication. We speak in a combination of English (my native language) and Spanish (his) and sometimes we think we understand each other but don’t. It’s so sturdy it may even hold up the house in the case of an earthquake. To the right of the structure is still a bit of closet hanging space where I hang my painting smock and my plein air painting outfit, a very lightweight, ventilated, long sleeved, sunproof shirt so I don’t need sunscreen and lightweight pants that are also sunproof that turn into shorts when you unzip and remove the legs. 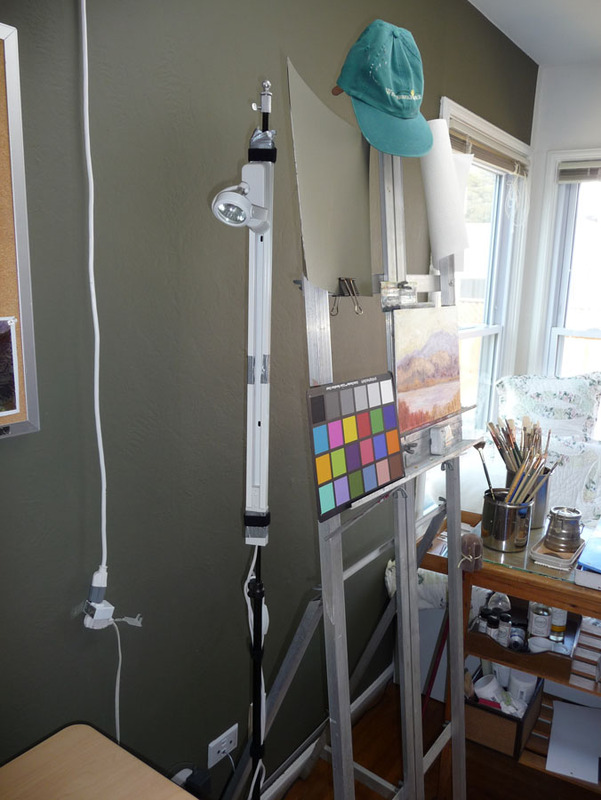 The top shelf of the structure (below) provides a place to put my other plein air gear: my Soltek easel, my brushes in a canvas brush carrier, and two canvas carriers from RayMar Art, the company from which I also buy my painting panels (they are archival, don’t warp and are less expensive than most of this quality). Below is the setup for lighting still life that I’m finally satisfied with, after trying numerous other lightbulbs, fixtures, and other accessories. 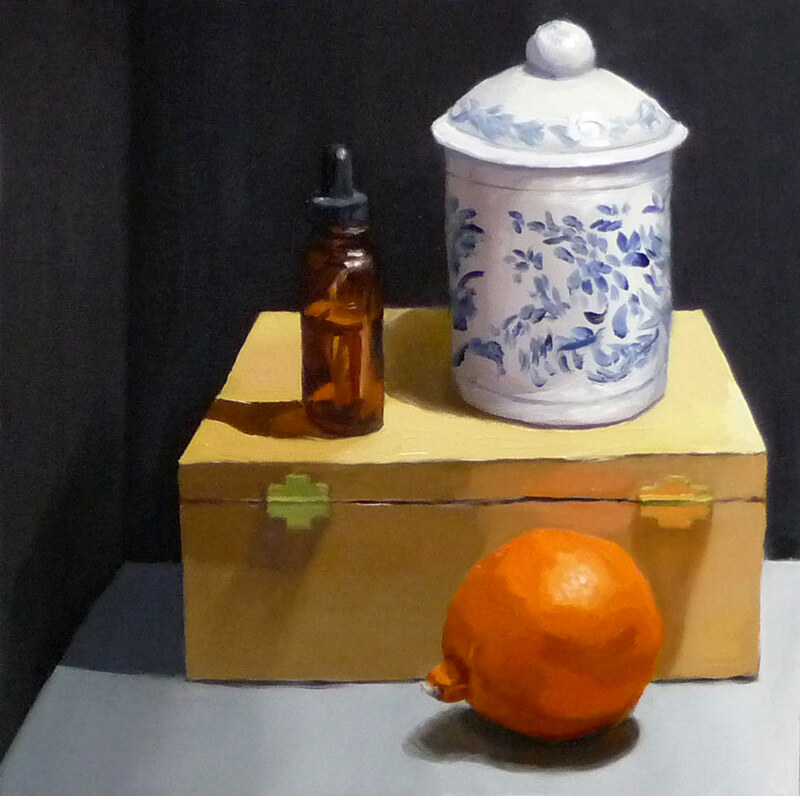 I wanted a way to get a strong directional light on the still life so there was good contrast in values, modeling of the shape and structure of the object(s), a strong shadow shape without double or triple shadows caused by interference from other lights, and a light color/temperature that gives the illusion of sunlight. A tall order indeed! As you can see above this system creates a nice swath of directional light, with a strong single shadow (though the photo doesn’t do it justice–it’s hard to photograph lighting!). Below is another picture of how I have it set up. I went to a local lighting store and we tried out all sorts of things. 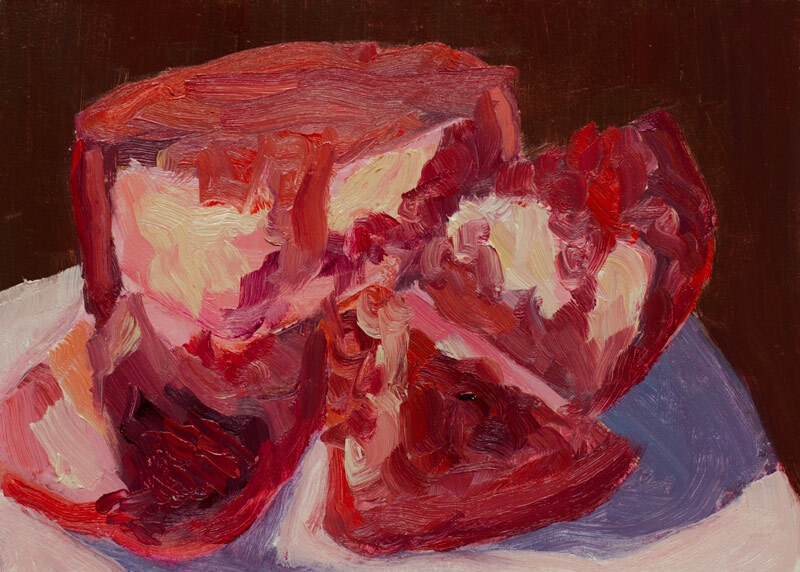 It took them awhile to understand that I wasn’t buying lighting to light a painting, but to light a still life I was going to paint. They recommended a short section of halogen tracklighting with a narrow-beam floodlight halogen bulb. They added a cord and switch for me since I was going to keep it nearby rather than permanently install it on the ceiling. 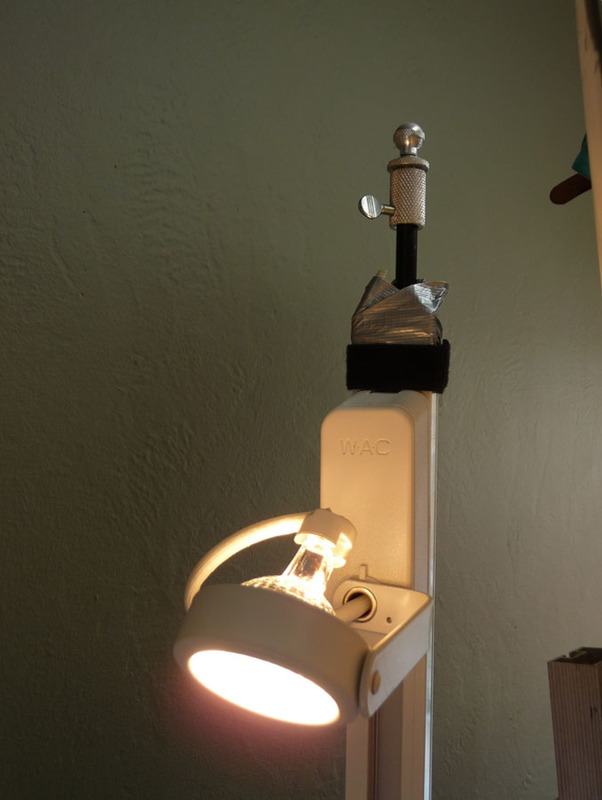 Then I attached the track light to a cheap old lighting stand I had from photography days. The ugly cord and switch on the left above is an inelegant solution that allowed me to avoid having to have an electrician wire the overhead light. It just plugs in and switches on and off. Too bad the cord isn’t the right length. 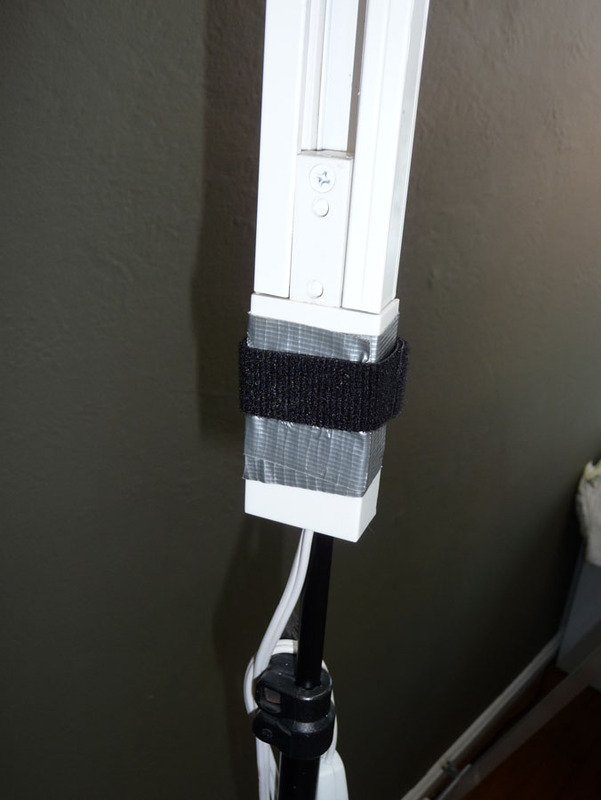 On the two pics below you can see how I used duct tape and a strip of velcro 2-sided strapping to attach the track light to the stand. 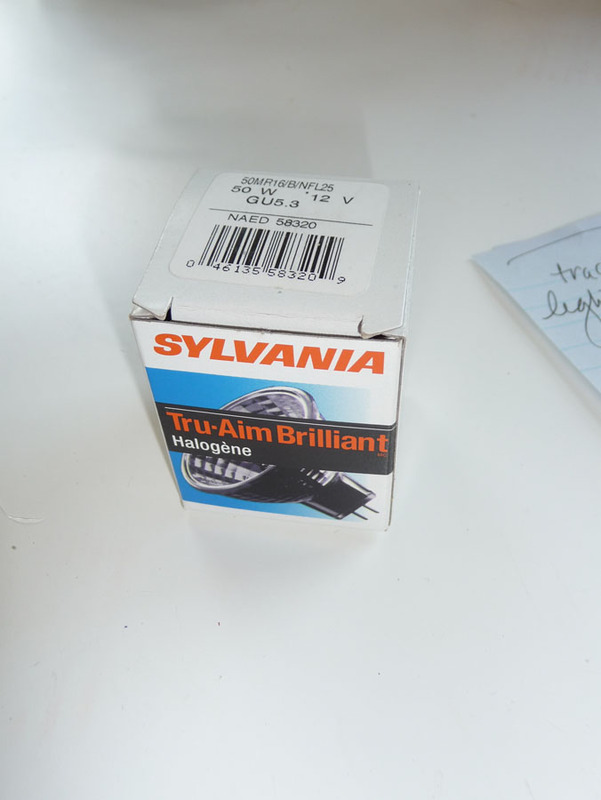 Below is the lighbulb we found that works perfectly for this application: Sylvania Tru-Aim Brilliant Halogen (50MR16/B/NFL25) which I think means it’s a 50 watt narrow-beam flood light. SInce the light was so bright I made this cardboard shield and painted it the same color as the wall and clipped it on to the easel so I could study the still life without also looking at the light. I’m sure there’s a more elegant solution, but this works. 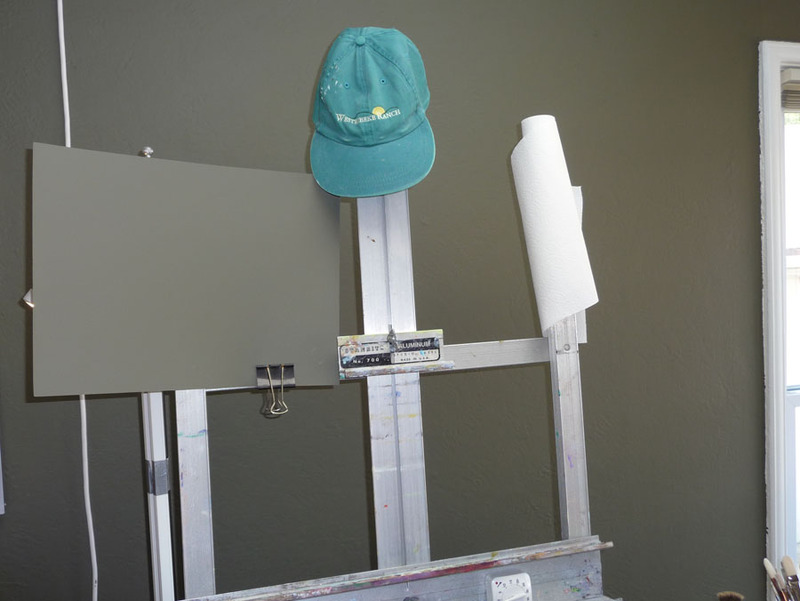 The paper towels sit on a funky paintbrush which is stuck into a slot at the top of the easel. Cardboard painted with wall paint to shade light, paper towel "holder"
My WorkRite electric desk, which holds my computer and monitor not only allows me to work sitting or standing but I discovered that I can use the end of the table by the easel to place a still life at whatever height I like. 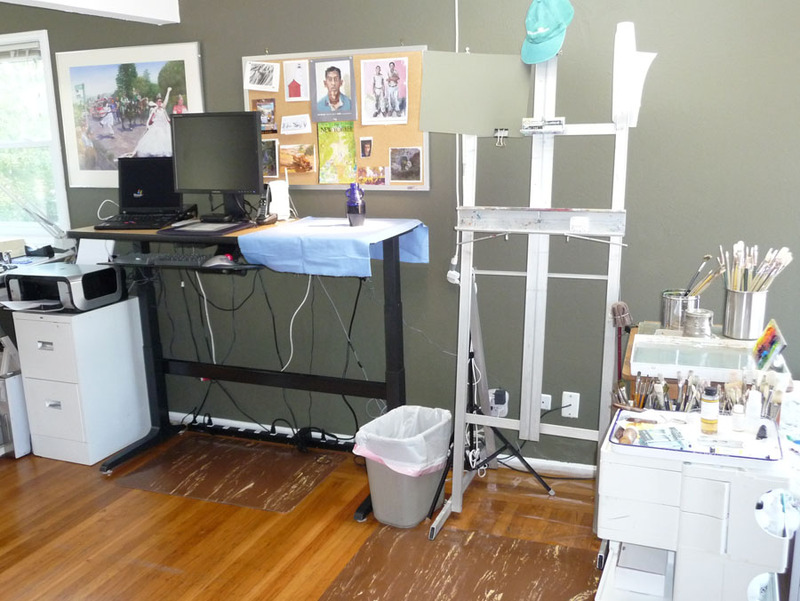 I can also display a photo on the monitor and scoot the monitor closer to the easel to work from. I can hang different colored cloths as still life backdrops from the bulletin board with pushpins and I like having artwork on it that inspire me. The painting to the left isn’t usually there. I hung it when a gallery owner came over for a studio visit because she was interested in including it in an upcoming show (it will be there next month — more about that later). I should also say that I have no financial or other interest in any of the companies or products I mentioned in this post. I just like them.